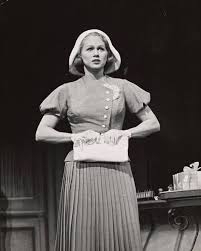 Barbara Cook in "She Loves Me." We were on our way to the beach on August 8 when the news came over the air: the Broadway star and matchless interpreter of the Great American Songbook, had died of respiratory failure that morning in New York at age 89. I'd last heard Barbara's voice, also on the radio, on June 30, when Fresh Air re-ran an interview Terry Gross conducted just over a year ago upon publication of Barbara's memoir Then and Now. The encore was prompted by Barbara's announcement that she was retiring. I shot her a mash note that afternoon, but never heard back, which seemed a sign. My first personal exchange with Barbara took place at the Juilliard School, at a reception after a master class. She was there to teach, not to sing, but the audience refused to let her go without performing a song herself. (This was to become a ritual, if it was not a ritual already.) She obliged with "Errol Flynn," Amanda McBroom's love song to her estranged father, the Warner Bros. contract player David Bruce. It's a heartbreaker of a song, and after the recent death of my father, it totally broke mine. I tried to tell this to Barbara over the canapés, in my tongue-tied way, and she thanked me as smart professionals do, keeping her distance without blowing me off. Not long after that, Town & Country—in the person of my mentor Philip Herrera—assigned me a profile of Barbara. I forget who set up the appointment, at her apartment on 86th Street overlooking Riverside Park and the Hudson River, but she wasn't expecting anyone when I arrived. Never mind, she said, and invited me in, first for that interview, and after the story ran, into her life. My wife and I moved to Maui in early 2011. In the three previous decades we had spent in the social swirl (such as it was for us) of Manhattan, I don't think we broke bread with anyone as often as we did with Barbara, notably at a New Year's dinner or two of hers, with the signature Dixie black-eyed peas and elegantly assembled sundaes. "If it's not pretty," she announced, as I carried in tulip after tulip, "I'm not interested." The company was always lots of fun: Elaine Paige, Andrew Lloyd Webber's original Evita and Grizabella, content just to be; the Mephistophelean John Glover, invincibly thespian; Barbara's son Adam LeGrant, an actor with a wicked turn of phrase... But it wasn't just the boldface names. Not to mention the inanimate glints of Barbara's sense of fun and style? The showerhead two feet in diameter, just like at the Ritz in London? The new suite of gilt dining chairs, with backs like the sun? And oh, her Christmas tree, decorated in messages as well as ornaments! An artful collage of my reminiscences of Barbara would challenge me at just this moment, or maybe at any time, so let me toss out highlights at random. I was fascinated by the portable hair-and-cosmetics studios she had at the ready for any public appearance—not just one case full of blush and rollers but two, just in case. It amazed me that between sets at Café Carlyle she would ascend to her guestroom in the hotel upstairs not to sit or lie down—mustn't muss her outfit—but to pace quietly and sometimes visit with friends. After well-publicized battles with the bottle decades before, her beverage of choice was sparkling water. I think, too, of that Juilliard master class when Barbara's blunt critique brought sent a student offstage in tears—"a first," Barbara remarked sheepishly to the audience, wondering what would happen next. What happened next was that the student quickly returned, having shed her affectations in the wings, and delivered a performance that left the listeners to do the crying. And then there was that late dinner at Fiorello's after an opera at the Met with friends from both sides of the footlights. We had the place pretty much to ourselves by this point, but a few tables over, a soprano voice rose in song. "There were bells on the hill..." Barbara looked at me and rolled her eyes. "I'm sitting right here," she said. "What does that woman think she's doing?" I imagine you recognize the lyric from The Music Man, which won Barbara her only Tony in 1958, the year a little boy growing up in Switzerland wore out the vinyl of the original Broadway cast album my Aunt Pat (the maiden Auntie Mame to a whole platoon of grandnieces and grandnephews) had thoughtfully sent from the Big Apple. It's been decades since I've given the CD a spin, but maybe I don't have to. I can hear every inflection just by thinking of the words. And it's not just "My White Knight" or "Will I Ever Tell You?" or "Seventy-Six Trombones." Remember the "Piano Lesson"? "I know what the gentleman wanted," Barbara's Marian the Librarian airily informed her mother. "What, dear?" Mrs. Paroo inquired innocently. "You'll find it in Balzac," came Marian's answer, dripping with superiority. Barbara and I hadn't known each other more than a year or so when she told me she'd be off to Europe shortly for dates in London and Paris. "Oh," I said, dropping the bombshell, "then maybe you'd like to come see my production of Lohengrin in St. Petersburg." "Wait a minute," Barbara answered. "What did you say?" Yes, Valery Gergiev, artistic director, chief conductor, and all-around head honcho of the Mariinsky Theatre, had invited me to direct or co-direct with him (the lines of responsibility were never very clear) a new production of Wagner's romantic masterpiece. Not, you understand, that I had ever directed anything before. (I discount that sketch in grade school.) But Valery knew me and thought I had ideas. Well, as it happened, our final rehearsals and premiere fell right between Barbara's show dates in the Western European capitals, so she came. At rehearsals, she spontaneously took the role of my personal photographer, taking the few snaps that document me on the job. I felt awkward to have so little time for her, since she had made the trip and all, but she made it clear she was having the time of her life. The one time I was able to sneak away for lunch, I took her to what in those frontier-town days was the restaurant for those in the know, below street level in what looked like a private residence. It was very quiet, too quiet, and the few other patrons had the sullen look of local mafia, which, judging by the prices, they probably were. The oversize pages of the menu were carbon copies out of a typewriter, cased in plastic. Barbara burst out laughing when she discovered the Frogs Paws. Her pleas for a copy to take home—alas, this was long before smart phones—were unavailing. The next day, she was on hand to shoot what must have been the strangest dress rehearsal she had ever seen. The singers began in street clothes, changing into their costumes as the wardrobe department unpacked them from crates just arriving by truck. On the champagne-dinner cruise on the Neva after the premiere, she sat at Valery's side at the head table, radiant through speeches that went on until dawn, many of them in Russian. She left St. Petersburg wishing to return to sing on the heavenly stage of the Mariinsky—one wish, alas, that never did come true. To close a show—whether in the shoebox that is Feinstein's or the cavern that is the Metropolitan Opera—Barbara would switch off the mic for one last, unplugged encore: unforgettable moments of sheer bliss. Offhand, I'd couldn't list them, but to me, one by Harvey Schmidt and Tom Jones, from The Fantasticks, may stand for all. Wonderful things come to be. Everything I dared for both you and me. If you never heard Barbara sing it, imagine.